1. What makes me the most emotional when I read? 2. What is the book that has made me the most emotional? Hands down Shiver by Maggie Stiefvater but The Host by Stephanie Meyer is a close second. 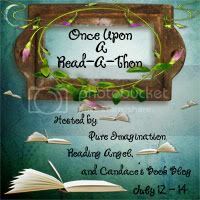 For more info on the Read-a-Thon click the picture on my left sidebar. Comment your updates or answers to the mini-challenge. Thanks for signing up!! I hope you are having fun! !